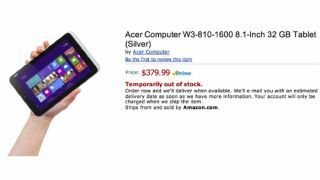 Amazon may have just accidentally spilled the beans on the Acer Iconia W3, an unannounced tablet that was previously rumored to be the first 8-inch Windows 8 device. The Iconia W3 appeared briefly today on Amazon.com under a listing titled "Acer Computer W3-810-1600 8.1-inch 32GB Tablet (Silver)." Interestingly, the Iconia W3 was listed on Amazon with a price of $379.99 (around UK£244, AU$368); this is the first we've heard of the tablet's cost. The Amazon link now leads to a "document not found" filler page, but Engadget managed to snap a screenshot, which you can see above. The photo of Acer's Iconia W3 that was posted with its Amazon listing today isn't new; it first appeared with a slew of other images when the existence of the new Windows 8 tablet was rumored last month. That rumor claimed that the Iconia W3 would come with a 1.8GHz dual-core Atom Z2760 processor, 2GB of RAM, and two cameras. The listing backed those stats up and also mentioned a resolution of 1280 x 800, integrated graphics at 64MB of memory, two megapixels for each cameras and a two-cell 3,500mAh battery that can last up to eight hours. Granted, the page also said elsewhere that the Acer Iconia W3 will pack a 1.5GHz Apple A4 processor, which is clearly incorrect, so the rest of those specs could well be off too. The Iconia W3's release date was initially estimated around mid-August, or by the time schools are back in session. Today's Amazon listing provided no hints as to dates, saying only that the 8-inch tablet was "temporarily out of stock." We asked Acer to comment on the leak but a spokesperson for the Taiwanese company informed us that they had nothing to add.